IVA has been featured in a national news story about “grit” and education. This is exciting and a further confirmation that what’s happening at the school is part of a much larger movement in the direction of a more personal and “humanizing” approach to education—one that aims to foster the personal qualities or character traits of good thinkers and learners. But how exactly are intellectual virtues related to grit? One of IVA’s “master virtues” is intellectual tenacity, a willingness to embrace intellectual challenge and struggle. This sounds a lot like grit. In fact, we can think of intellectual tenacity as grit applied to the processes of thinking and learning. However, understood in this way, grit is just one aspect of good or “virtuous” intellectual character. Other intellectual virtues include curiosity, intellectual humility, attentiveness, intellectual carefulness, and open-mindedness. As this suggests, an intellectual virtues framework allows us to situate the concept of grit within a broader context and to better understand its pros and cons. One potential con mentioned in the NPR story concerns the way in which trying to make kids work harder, persevere, and become more “gritty” can squelch “intrinsic motivation” or a genuine love of learning. Where the focus is not just grit or intellectual tenacity, but also qualities like open-mindedness, wonder, and curiosity, this problem doesn’t arise. The goal should be to foster grit along with these other important traits, which are closely tied to intrinsic motivation. But is there, perhaps, a problem with referring to grit and these other traits as “character traits” or “virtues”? The news story raises this question, pointing out that the term “virtue” has moral overtones. While this is a reasonable question, it contains two mistaken assumptions. First, it assumes a very narrow definition of morality. For millennia, some of world’s best thinkers have described “morality” or being a “good person” in much broader terms. On their view, to be a good person is to love and pursue things that are good. Or, as philosopher Robert Adams puts it, it is a matter of “excellence in being for the good.” Truth, knowledge, and understanding are, of course, among the many good things that life has to offer. Intellectual virtues are simply the character traits required for the successful pursuit of these important goods. Second, the question betrays a misunderstanding of how broad the concept of character really is. To master a difficult idea or to make a scientific breakthrough, one needs to act, think, and feel in various ways: to care about the truth, ask good questions, focus intently on important details, be willing to consider counter-evidence and alternative explanations, persevere in the face of struggle and failure, and so on. In other words, one needs to be curious, attentive, open-minded, and intellectual tenacious. This underscores the fact that a person’s character bears, not just on how she treats other people, but also on who she is as a thinker and learner. That’s the focus at IVA. The biggest concern of the administrators and teachers at the school is who students are becoming as thinkers and learners. This is not an alternative to focusing on content standards and academic skills; rather, it is a way of approaching these things—a way that adds greater meaning and purpose to the enterprise of education. Long Beach school district officials gave the green light to a charter school that’ll open next year with the mission to teach “intellectual virtues,” a concept with roots in classical Greek philosophy. Two Southland philosophy professors launched the charter school effort; public school teachers and parents have joined in. Their goal is to instill critical thinking skills they believe are woefully underrepresented in public schools. The study of how people develop life-long intellectual traits is called virtue epistemology. It’s become a branch of philosophy research in the last two decades. Loyola Marymount University philosophy professor Jason Baehr has made it his expertise for more than a decade. But just researching and writing about the topic left him unfulfilled — especially after he saw the way public schools value rapid recall, high IQs and high scores on multiple-choice tests. “What that stuff leaves out is a more personal dimension, personal qualities like curiosity and attentiveness, open mindedness, intellectual carefulness, intellectual thoroughness, important for knowledge and learning,” he said. Armed with a project grant of more than $1 million from the John Templeton Foundation, Baehr organized a one-week crash course on virtue epistemology for teachers during the summer. National and international experts offered a dozen L.A. and Orange County educators ideas on how to teach students to become lifelong critical thinkers. The group met in October to talk about how it’s working in the classrooms. “The kids at first gave the expected answers, the expected to hear, develop skills, better readers,” she said. “OK, what else?” she asked the students. There was a long, uncomfortable pause. Beautiful, Lo thought. The observation prompted a 10 minute student discussion. Lo said students became much more engaged talking about the 2500-year-old play. Teachers learn about nurturing critical thinking skills in their teacher education courses and in professional development classes once they’ve begun teaching. San Pedro High School English teacher Jaquie Bryant said none of that training unlocked the secret to teaching critical thinking. “I never quite understood what that was. And I would try some activities but I didn’t have a language or a frame of mind to know what I was doing with my students,” she said. Teacher Agustin Viyera said he’s begun getting students to think about what it means to be open minded, intellectually courageous, and intellectually humble as soon as they start their day. He shared a video he took of a morning call-and-response ritual that sounds like intellecual boot camp. The students in the video nearly yell: “Be intellectually aggressive. Be intellectually humble. Be respectful of all people and things. Sit like a scholar. Be an intellectual leader.” Some of them raise closed fists as they recite. “Every morning part of our routine is to do our pledge to our country, our pledge to our school, and our pledge to ourselves and our classroom. It’s a two part pledge I make my pledge to them, my pledge is to give them my best, to challenge them, to treat them as scholars,” Viyera said. His third graders, he said, are developing into an intellectual community with a more sophisticated understanding of what makes a good thinker. U.C. Irvine researcher Elizabeth van Es says what’s kept this type of classroom approach from taking root on a mass scale in public education is that U.S. public schools have a set of institutionalized routines to educate students that don’t leave much room for such out of the box learning. “Many educators have been advocating for this type of learning for over a hundred years,” van Es said. That’s one of the reasons philosopher Jason Baehr and others have set out to turn a philosophical idea of intellectual virtues into a brick and mortar, independent charter school. 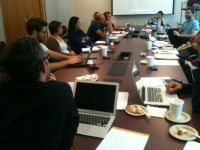 Baehr, a Biola University philosophy colleague, and former teacher Bob Covolo and others opened the board meeting of the future Intellectual Virtues Academy at a Cal State Long Beach classroom on a recent evening. “I just want to start off by saying this is exciting and I’m thrilled to be a part of something really valuable,” Covolo said. Board member Shelly Milsap said she plans to enroll her three school-age daughters in the Intellectual Virtues Academy when they’re old enough. “It’s not just a philosophical endeavour, I’m an implementer. I come from a business background and it’s really important to me that this doesn’t just maintain an ideas driven concept that’s actually being applied and is accountable and we have action oriented results,” she said. Long Beach school district officials approved the school to launch a sixth grade class in the fall and seventh and eighth grades in subsequent years. Finding a suitable facility – and raising the money to sustain it – are big concerns, board members said. Meeting standardized test requirements that require few critical thinking skills should be another big concern for the school, said U.C. Berkeley education researcher Janelle Scott. “What happens if the teachers are teaching in in the way that more grounded in this model and the students don’t perform on the assessments in the way that they had hoped. Do you then abandon that approach in favor of something more traditional or do you persist?” she asked. Founders of the charter school maintain that if they teach students to model the thinking skills and traits of the ancient philosophers, mastery of any subject matter will follow. Intellectual Virtues Academy of Long Beach, a new tuition-free public middle school, chartered by the Long Beach Unified School District, celebrated its opening day Sept. 4 with a ribbon-cutting ceremony and celebration. Founder and board member Steve Porter was present to welcome families and community members along with founder and board member Jason Baehr, who described how educators from many nations, including Kenya, Cambodia and the Philippines, have expressed interest in the intellectual virtues model of education being implemented at Intellectual Virtues Academy. Chairman of the board, Eric Churchill, presented a myrtle tree – symbolic of a seed of an idea taking root and giving rise to something that is significant and lasting. – Rebecca Irwin is part of the founding team of Intellectual Virtues Academy. The school is located at 3601 Linden Ave in Long Beach. Long Beach’s newest charter school opened Wednesday with a ribbon cutting ceremony as students arrived for their first day of school. Intellectual Virtues Academy, a middle school, opened its doors at 3601 Linden Ave. with an initial enrollment of 56 students and a waiting list of more than a dozen. Administrators say they will hold enrollment at 54 students after the first day. The school opened with two classes of 27 and 28 sixth grade students, two full-time teachers, two part-time elective teachers (for music and physical education), two part-time office staff and a full-time principal. Administrators plan to add two classes of 25 students each over the course of the next three years, ultimately serving 150 students in grades six through eight, according to IVA board member Rebecca Irwin. IVA’s curriculum is based on an education model aimed at fostering growth in “intellectual virtues,” the personal qualities of a good thinker or learner, Irwin said. Teachers, board members and the students’ families have participated in a number of gatherings over the summer in preparation for the school’s opening. A Parent-Teacher Association (PTA) has already been formed, headed by newly elected president Janet Watt. Lisa McCarthy, the founder of Mark Twain Elementary School’s “Green Team” environmental program, will run the school’s recycling program. The school is chartered by the Long Beach Unified School District and funded in part through a $1 million grant from the John Templeton Foundation, which funds both the school and the Intellectual Virtues & Education Project at Loyola Marymount University. The Long Beach Unified School District unanimously approved a new Charter Middle School called the Intellectual Virtues Academy Tuesday night. The school will service middle-schoolers, grades 6 through 8 in Long Beach. The decision came after the Department's comprehensive review of the application for the new school. This review included a rigorous analysis of the proposed school’s education program, business plan, and governance structure. The Long Beach Unified School District and Intellectual Virtues Academy Board of Directors also agreed to a Memorandum of Understanding. "We’re delighted that the board found merit in our proposal," said Dr. Jason Baehr, Board Member and visionary of the Intellectual Virtues Academy. "Much hard work lies ahead, but we are eager to meet the challenge." IVA will be based on an “intellectual virtues educational model,” which is a model aimed at fostering intellectual character virtues like curiosity, wonder, attentiveness, intellectual autonomy, intellectual carefulness, intellectual thoroughness, creativity, open-mindedness, intellectual humility, intellectual autonomy, and intellectual perseverance. The John Templeton Foundation has awarded a $1 million dollar, three-year grant to Dr. Baehr to develop and apply this educational model. Over $600K dollars of the Templeton Grant will go directly to IVA. Intellectual Virtues Academy plans to open its new school in fall 2013, welcoming two incoming classes of 50 sixth-graders. IVA will add one grade each subsequent year until it reaches 150 students in three grades. The location has not yet been determined, but we are working to identify several workable and attractive options, IVA Board Member and visionary Dr. Steve Porter said. Intellectual Virtues Academy, or IVA, is a public charter school. It does not charge tuition. Long Beach Unified students will have priority in registration. IVA Board Member Mynor Montiel said if applicants exceed available space, the school will hold a lottery. Intellectual Virtues Academy is a public charter middle school serving grades 6-8 in Long Beach, California. The school’s charter was approved by LBUSD on October 9, 2012, and is scheduled to open in the fall of 2013 with two sixth grade classes of 25 students each. Registration will begin in the spring of 2013. Loyola Marymount University Professor of Philosophy and Long Beacher Jason Baehr has dedicated over a decade’s worth of research and writing to one thing: intellectuality, through both its character and virtues. And of course, like any model academic, he craved not just the theoretical side of his work but the actual implementation of it through an educational model molded by the virtues he studied in order to find the qualities of great thinkers and learners: curiosity, wonder, attentiveness, open-mindedness and intellectual humility. Four years ago, these questions were put to a reality check via his friend and fellow Long Beach resident, Biola University professor Steve Porter, who suggested they create a charter school together. The Intellectual Virtues Academy (IVA) was born. This endeavor did not come without its difficulties and rocks in the road, however—the two largest ones being the ability to bridge funding so as to make the school financially viable after building enrollment and the ability to have a curriculum that could live up to the hopes they had in their head. The former was cured by a $1 million grant given to the pair in April of this year from the John Templeton Foundation, permitting them to go full-steam ahead in actualizing the school. The latter problem, however—the curriculum itself—is a different story. By literally, he means not only actualizing the tangible form of the school itself, but how chief tenets of philosophy and psychology that surround character strength can be taught. The academy will emphasize the trending educational idea that the experience of learners and teachers should not be ruled by standardized tests and “teaching to the test,” that is, creating curriculum around solely ensuring that students test better without acknowledging critical thinking skills or elaborate, multi-faceted answers. While Porter and Baehr begin to scout out locations for the academy and hope to announce its home by no later than the start of 2013, they plan on opening doors in the fall of that year with two sixth grade classes. Each grade will consist of what they expect to be 50 students, with two classes divied up between each grade. Following the inaugural year, the academy will add one grade per year for the following two years with a hope of having about 150 students, sixth through eighth grade.